As the procession carrying George H.W. Bush’s casket approached the Washington National Cathedral, thousands of people lined the streets of D.C. to pay tribute to the former president with nothing but their presence. WASHINGTON — It was a moment like no other here in D.C., as the state funeral for the nation’s 41st president unfolded with military precision at the National Cathedral. 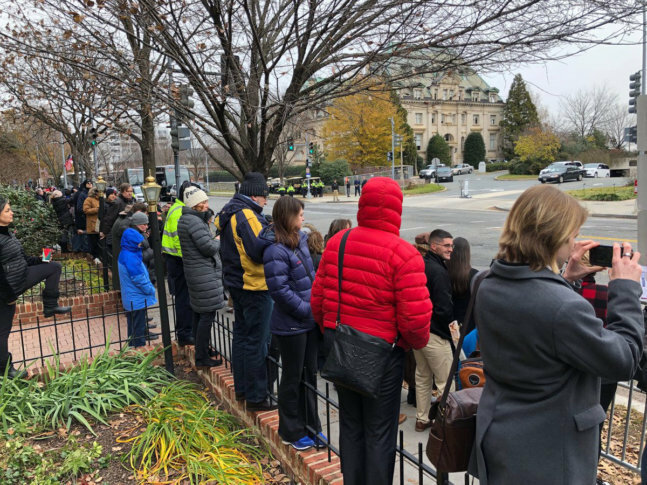 And outside the cathedral, people lined Wisconsin Avenue to get a glimpse of history and the motorcade carrying the late president. As the Bush family watched nearby, the flag-draped casket was carried up the steps and into the cathedral. Former President George W. Bush and his siblings then solemnly made their way inside. Washington has now said its final goodbye to George Herbert Walker Bush, who will be flown to Texas and his final resting place. WTOP’s Mitchell Miller and John Aaron contributed to this report.